The Peacock Dance is the most famous traditional folk dance of the Dai Minority in China. It is prevalent in the Dai and Jingpo minority autonomous prefectures as well as gathering areas of the Dai people. Legend has it that more than a thousand years ago, Zhaomali Jieshu, the head of the Dai minority, learned to dance through imitating the elegant gestures of the peacock. The dance was afterwards promoted by later generations of folk dancers and spread widely before it finally became the present peacock dance. In the mind of the Dai people, the "Holy Bird" or the peacock, is a symbol of happiness and auspiciousness, and thereby is a common role in numerous folk legends. Its dance is the favorite dance of the Dai people and is a necessity for every folk-custom festival. It has a fixed performing order. Generally it starts by presenting the scene of a peacock's leaving its nide, looking around and dancing trippingly on the lawn, then continues by drinking water and looking for food, and finally, ends by bathing in the fountain, shaking off water drops on its body, spreading out its gorgeous feathers and extending wings in flight. In the dance, the dancer is featured by ductile and undulate knees, swift and agile motion of lower legs, and flexible eye expressions. Through arms, wrists and fingers, a range of motions of a peacock are imitated in virtue of plentiful hand postures. Moreover, sylphlike postures of a peacock are reproduced by the dancer's elegant "Three Curves" formed by downward bending and stretching all arthrosises of limbs and body and evenly vibrating the entire body. 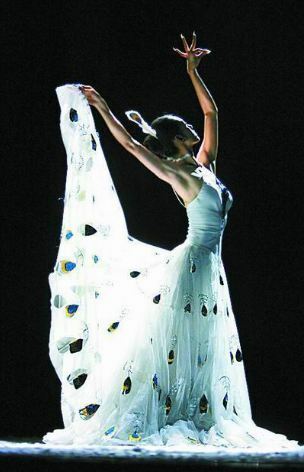 With graceful and dainty postures as well as subtle emotional expressions, the Peacock dance is a crystallization of wisdom of the Dai people with comparatively high artistic taste and in the meanwhile, has won the highest degree of cultural identification among all forms of dances of the minority. In 2006, it was listed as a national intangible cultural heritage in China.